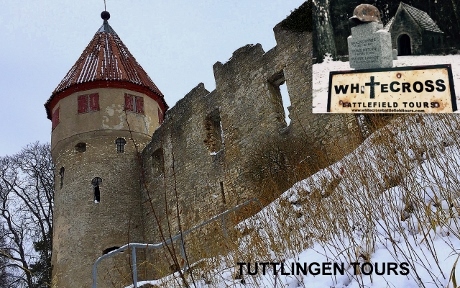 HONBERG – The beautiful Honberg Castle ruins, overlooking the city. 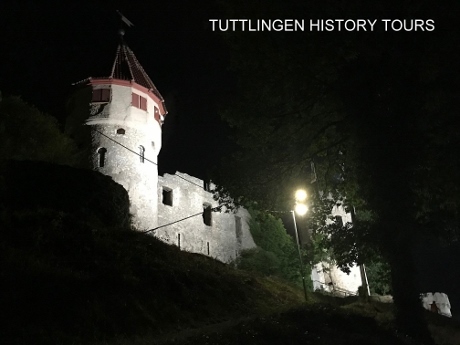 OLDEST HOUSE – The oldest house in Tuttlingen, the location of the old city walls & a discussion about the great fire, that destroyed most of the inner city. 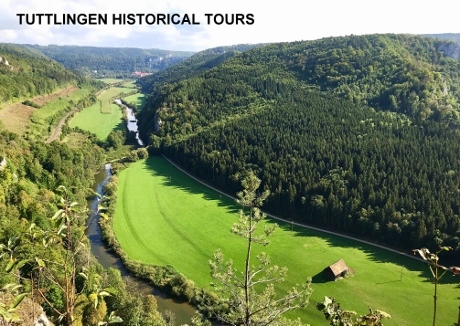 DANUBE WALK & P.O.W CAMP – A short walk along the Donau River (Danube) to Lager Muhlau – Former location of a huge P.O.W camp, that once held 300,000 German Wehrmacht soldiers. 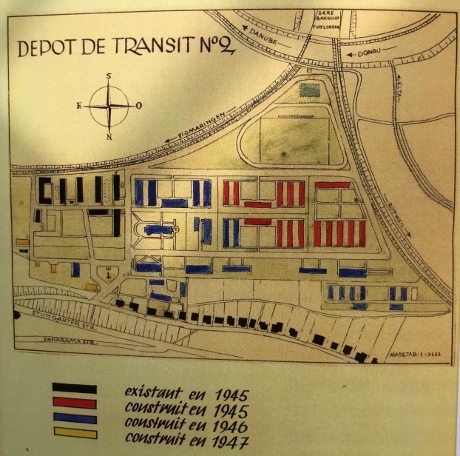 Including a look at the Kommandant’s Villa, the location of the former entrance gate, a large restaurant that once cooked all the food for the inmates and the unloading ramp location, from the trains. FACTORIES – A look at several large factories that once made leather goods (some still do) and during World War 2 – they produced boots, uniforms and weapons etc for the German army. 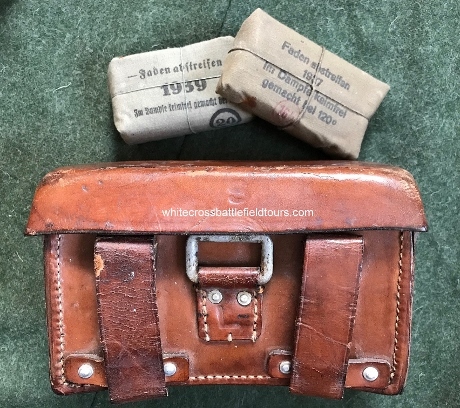 Below photo: Original Leather WEHRMACHT MEDIC’S Sanitatstasche (Medical bag). Dated 1940 and made by Tuttlingen factory BOLLMANN GMBH & Co…. During WW2, Tuttlingen and it’s railway station (Bahnhof), suffered 5 air-raids, by allied planes. Therefore, I can show you where houses and buildings were destroyed, the targets of the raids and a short forest walk, lwill show you 2 huge bomb crators, from one of the raids. Cemetery memorial to several hundred Nazi victims that were murdered prior to the end of WW2. ADOLF HITLER PLATZ -Location of the former restaurant, where the local S.S had gatherings and important meetings, plus the site where a tree was planted in 1933, to commemorate Hitler. The street was re-named Adolf Hitler Platz. Former temporary Lazarett’s (Military Hospital’s), that were used to treat wounded soldier’s. BRIDGES -A look at the old bridge that was wired with explosives as the French soldiers and tanks tried to cross the Donau (Danube). 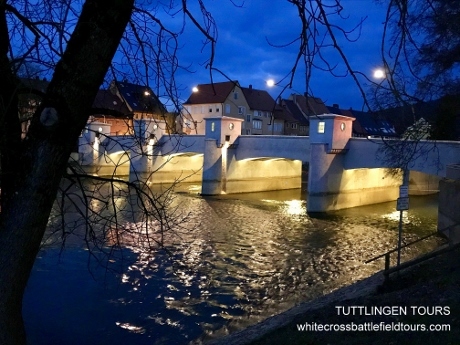 WAFFEN SS – Exact location of where 50 Waffen S.S armed soldiers tried to stop the first French tank entering Tuttlingen, in April 1945 and where the ensuing battle occurred. JEWISH SLAVE LABOUR – Former slave labour quarry. 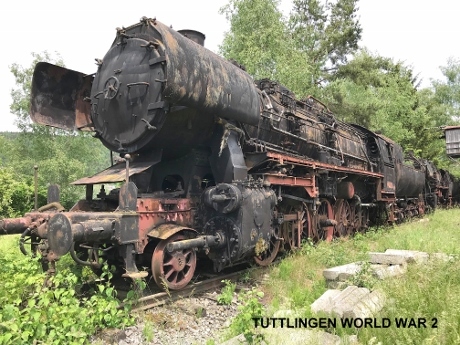 LOCOMOTIVES – Several original Locomotives, that were used to haul troops, tanks, supplies, armour, and jews to the concentration camps, during the war. LUFTWAFFE BASE – The former Luftwaffe Night Fighter Airfield at Neuhausen, with it’s runway, former Luftwaffe ammunition bunkers and memorial to a crashed British Lancaster bomber, that was shot-down by a Messerschmitt BF110 Night Fighter. All the crew were sadly killed. I can show you the crash site deep in the forest. Also – location where a HEINKEL 111 bomber exploded by accident and killed several Luftwaffe soldiers who were loading it with ammunition and bombs. The graves are nearby. 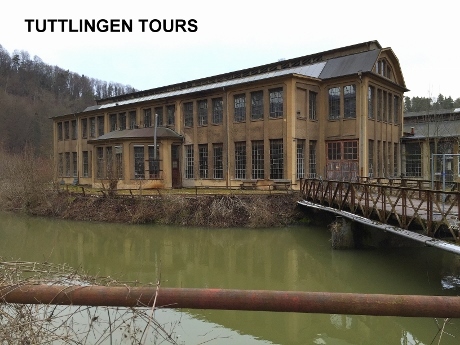 GUNPOWDER FACTORIES – The former World War 1 & 2 gunpowder & ammunition factories at Rottweil and Rottweil Prison, where Stauffenberg’s mother was once imprisoned. KZ ECKERWALD – Former Nazi Concentration Camp slave labour works and memorial site. CONCENTRATION CAMP -KZ Spaichingen. Location of former slave labour camp and memorial. CRASH SITE – Location of where a MESSERSCHMITT BF110 crashed and killed the pilot. 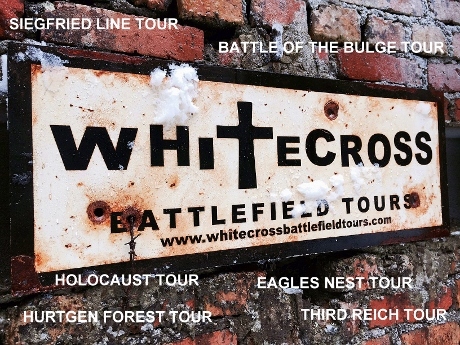 FOXHOLES – Many Foxholes used by WAFFEN S.S soldiers at the end of the war and an observation bunker. Plus bomb crators nearby. 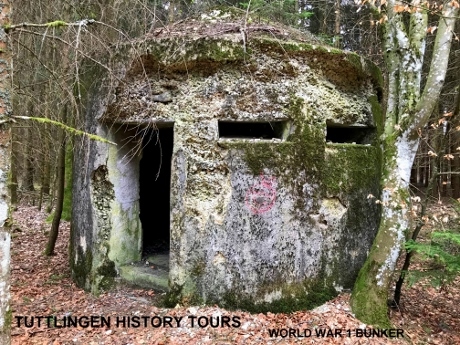 BUNKER WW1 -A World War 1 artillery observation bunker. 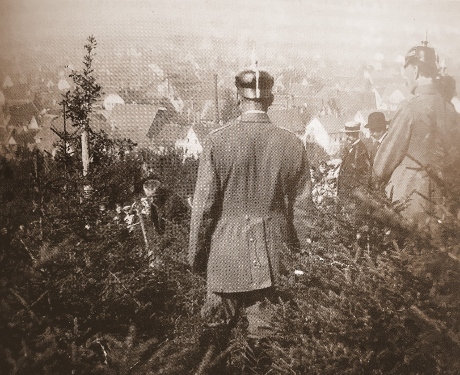 LAST BATTLE – The route of retreat for 2,000 German soldiers, being pursued by French soldiers, to make a last stand at Zimmern, on the Donau (Danube). These were remnants of the 106th Infantry Division, 719th Infantry & 352nd Volksgrenadiers. 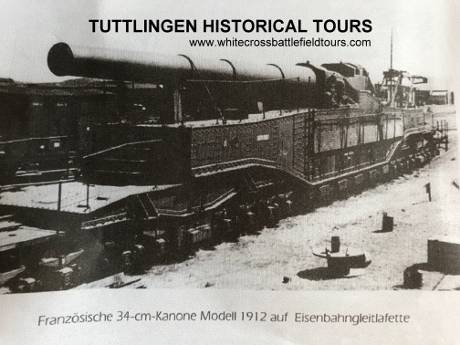 RAILWAY GUN – The location of where a huge WW1 railway gun was used to test artillery shells, by firing over the Donau (Danube) into the cliff face opposite. (You can still see the impact holes on the cliff face). FIELD GRAVE – Location of where a returning Wehrmacht soldier, was executed by French soldiers.